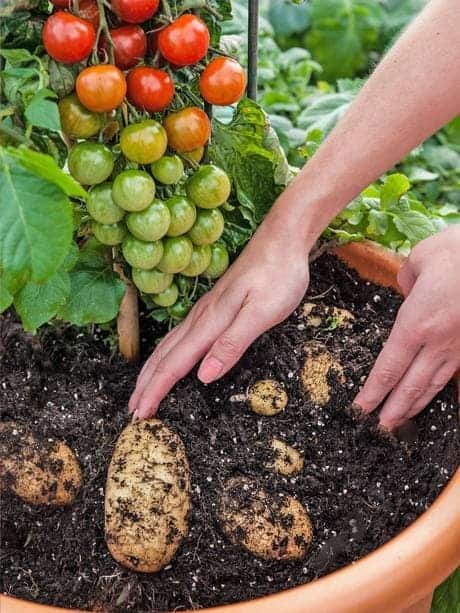 The pomato plant exists (feel free to call it tomtato, I just swing between the two names), and is produced by grafting a tomato plant and a potato plant. They yield both potatoes and tomatoes without affecting the quality of the crop. Even though they may not strike you as related, both these plants are part of the same family – the Solanaceae (nightshade) family. Although these plants can’t be crossbred, they can be grafted, and thus growing both tomatoes from the tomato shoot and potatoes from the rootstock, saving valuable space in gardens and fields. Cut the roots from the tomato plant, then make a straight cut on the stem. Further cut material from both sides of the bottom of the stem, so that it has a wedge shape and fits in the “V” of the potato plant. Slide the two cut pieces together and wrap the graft with grafting tape, ensuring that it holds; if you want to improve your chances, set the plants temporarily in an area that isn’t very rich in sunlight. After two or three weeks when the plant starts showing signs of growth, you can remove the grafting tape. The tomtato plant has been launched in the United Kingdom in September, 2013 by a horticulture company called Thompson & Morgan; it is not genetically engineered – it’s created through grafting, and can be grown both indoor or outdoor. Pomato plants have been seen as a new technology to make crops more efficient, maximizing the yield that can be produced on a piece of land or in a small urban environment like a balcony. Interestingly enough, this idea was initially implemented in a Kenyan prison garden, to fight the hunger which was a big problem. They have already started implementing not only tomatoes and potatoes, but also cherry tomatoes and sweet potatoes. In developing countries such as Kenya (and not only), this technique can save on space, time and labour without affecting the quality of their produce by growing tomtato plants. Grafting can also improve resistance to bacteria, fungi, and other pests.